A lullaby is a simple expression of the most universal human condition, the bond between parent and child. One of the earliest lullabies in recorded history was written in 2000 BC, and 2018 marks the 150th anniversary of Brahms’ Lullaby, so this precious musical tradition has deep cultural and emotional roots. These personal songs bring people together, span generations, and tell stories about where we come from, who we are now, and our hopes for the future. The legacy continues with the release of "Hopes and Dreams: The Lullaby Project" on April 20 on Decca Gold (Verve Label Group). The recording is inspired by the Lullaby Project, a program of Carnegie Hall’s Weill Music Institute which pairs pregnant women, new mothers, and family members with professional artists to write and sing personal lullabies for their babies, supporting maternal health, aiding child development, and strengthening the bond between parent and child. 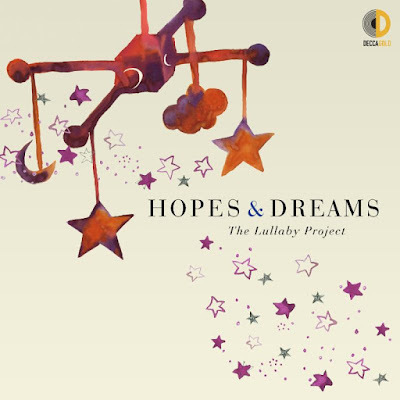 "Hopes and Dreams: The Lullaby Project" features fifteen lullabies written by parents from across New York City, as performed by Fiona Apple, the Brentano String Quartet, Lawrence Brownlee, Rosanne Cash, Joyce DiDonato, Janice Freeman (The Voice 2017), Rhiannon Giddens (Nashville), Angélique Kidjo, Patti LuPone, Natalie Merchant (10,000 Maniacs), Dianne Reeves, Gilberto Santa Rosa, Pretty Yende and Catherine Zeta-Jones. "Hopes and Dreams: The Lullaby Project" brings together an internationally acclaimed roster of talent to perform and record these personal lullabies. The album includes tracks in Spanish and French as well as English, reflecting the multi-cultural identities of the mothers themselves. All of the performers on the recording represent a wide variety of musical genres, including pop, folk, classical, country, salsa and jazz. Janice Freeman, who drew legions of fans for her soulful performances as a contestant on The Voice in 2017, chose this project as her first recording since appearing on the popular music show as part of Team Miley Cyrus. During that time, it became known that she struggled as a single mother with the passing of her daughter Hannah’s father from cancer just four years after her birth. Subsequently, Janice herself was diagnosed with cancer and lupus and dedicated her performances on The Voice to her daughter. Grammy Award-winning mezzo-soprano Joyce DiDonato lends her renowned vocal talents to the project’s title track “Hopes and Dreams” recorded with the Brentano String Quartet. Joyce has been involved with the Lullaby Project for over five years and met Elsa Negron, the mother who wrote “Hopes and Dreams,” when she performed the song at a special concert hosted by Carnegie Hall. The Lullaby Project was inspired, in part, by the experience of songwriter Thomas Cabaniss, who years ago began creating personal lullabies as gifts to friends expecting children, and later for his own kids. Carnegie Hall’s first Lullaby Project took place at Jacobi Medical Center in the Bronx in December 2011, led by Cabaniss and fellow teaching artist Emily Eagen, in response to the needs the hospital saw among their pregnant teen patients. Since then, more than 800 lullabies have been written and recorded in healthcare settings, schools, foster care settings, homeless shelters and correctional facilities in New York City, across the United States and around the globe. Extending across the country and through several international pilot programs, the Lullaby Project enables twenty partner organizations to support families in their own communities. To better understand the effect of music in early childhood development, Carnegie Hall has also commissioned two research papers from Dr. Dennie Palmer Wolf, an expert in the field, entitled Why Making Music Matters and Being Together, Being Well. Over the last three years, the artists featured on this album, the songwriters, Carnegie Hall teaching artists, and partners all connected with a single collective purpose: to celebrate the families who have shared their personal stories through the Lullaby Project. These are stories about love and loss, resiliency and joy, and about holding the people we love close, wherever we go. Lullabies are intimate and tender expressions of our hopes and dreams for our families, for ourselves and for our world. Join us in singing, sharing, and creating lullabies with those you cherish most. Produced by Glen Roven, Ira Yuspeh, and Mitch Yuspeh.